Hour 22 (5 am). Around 5:30, I lay down “just for a minute” to read and woke up an hour later. I guess all the Diet Coke didn’t really do anything for me. Reading is such a subjective pleasure, that it’s difficult to recommend. But in general, a readathon is not the best place for anything too thought-provoking or requiring a slow read. I started out with the marvellous Cain by Jose Saramago which is only about 160 pages long, but it took me a few hours to get through it. This was my first readathon so these two questions are really difficult to answer. I appreciated the support and the challenges, but I’d be happy to do it in a little bubble of my own as well. I read four paper books and finished three. I also listened to part of an audiobook. In terms of pure joyfulness, the book about being Parisian was great. An excellent break after Cain. I also loved the Ozeki and will be listening to the rest over the next few days. The book about Iris Murdoch, written by her husband, was really about him. I was disappointed in many ways. Goodreads review to follow. I will definitely participate again, taking a little more care in choosing appropriate books. My spouse wasn’t able to participate this time, but says that he wants to do it with me next year. We’re eating dinner and I agreed to start watching The Fifth Estate with my husband, but I’m going to escape to the bedroom to read momentarily. How to Be Parisian Wherever You Are: Love, Style, and Bad Habits by Anne Berest et al. This was in our Airbnb apartment in Paris last month and I had to have it. My new lifestyle guide. I’m on my third book, but I’ve only finished one (Cain by Jose Saramago.) I’m also listening to the audiobook of A Tale For The Time Being by Ruth Ozeki, but this is a fill-in book for when I”m cooking, walking the dog, or folding laundry and can’t read a regular book. It’s also a great read. Iris and Her Friends: A Memoir of Memory and Desire by John Bayley. Mainly as above, and i’ve used an audiobook. Plus I felt for my dear husband and agreed to watch a movie with him for a few minutes. How difficult it is to stay off social media. Monitor me at Facebook, Twitter and Instagram, and tell me to get reading! The Hour 9 Mini-challenge is interesting. To enter the Book Scavenger Hunt, look at the item list below and find a word, phrase or thought IN THE BOOK YOU ARE CURRENTLY READING that fulfills that item. For example, if the item were “something soft”, your answer could be a word – “kitten”; a phrase – “a satin ribbon the color of Jersey cream”; or a feeling “he leaned to her and kissed her cheek”. Be creative! I switched to an audio book a couple of hours ago so that i could shower, prep my lunch, and relax my eyes a little. I am very much enjoying A Tale For The Time Being by Ruth Ozeki. This is the book I’m using for my scavenger hunt. It’s set in Tokyo and on Cortes Island in British Columbia. Something sweet – cataracts in great-grandmother referred to as flowers of emptiness in Japanese. Here’s another mini-challenge: create a top 10 list that has something to do with the readathon. Get a good sleep the night before. Warn housemates that you will not be doing anything but reading. Diet coke to drink in place of the martinis you might otherwise consume. Stay off social media. Except when you don’t. Readathon: Judging a book by its cover. The second mini-challenge in the readathon is hosted by Unabridged Chick. Dig through your shelves and share with us a book cover you’d like to escape into! Doesn’t matter if the subject, plot, or genre isn’t typically your thing; in this case, we’re totally judging the book by its cover! I did a quick search and came up with this novel, that I haven’t read yet. Doesn’t it look like a great house to read in? Cozy rooms, lots of light and nooks, carpets on hardwood? This is the kind of feel we’re working to create in real life. It’s the beginning of the challenge and my hours of reading bliss await. 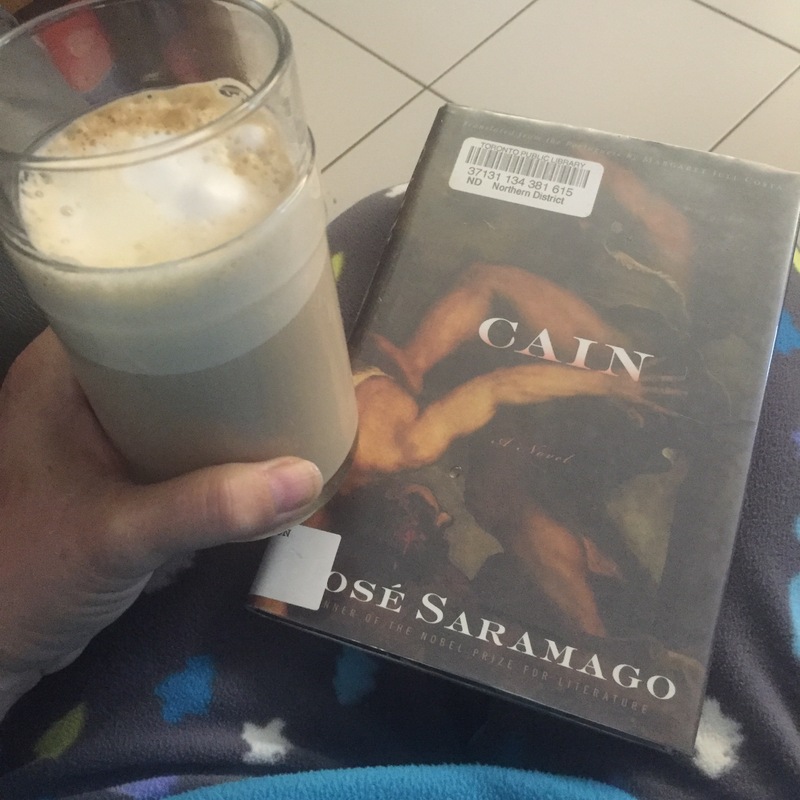 The fireplace is on, the coffee is made, and my first book is chosen: Cain by Jose Saramago. One of the first mini-challenges posted by our hosts is an introduction questionnaire. This is a hard one but probably John Mortimer’s autobiographical Summer Of A Dormouse will provide some comic relief. Anything with avocado on it. I’ve got some whole ones for chopping onto pinto bean soup and some pre-made guac for dipping. I’m a 55 year old empty-nester. The only things that stop me from reading all the time are domestic chores, genealogy, choral singing, and arts events (opera, theatre, music, galleries.) And I listen to audiobooks while I do chores. It’s my first. Guilt-free reading! … for the 24 hour readathon! It starts tomorrow at 9 a.m in Toronto, and varies by time zone. You can get your start time here. This will be my first year participating and I’m very excited. Since our reno finished last month, we have boxes and boxes of stuff to sort: purge or place. This is always on my mind. An on-going item on my todo list and so the readathon will give me permission to forget about those things for a while, get cozy in front of the fireplace, and get through some of my to-read pile. It will also (I hope) help me kick the lingering cold that hampered our Thanksgiving plans last weekend and is lingering in my sinuses and ears. In preparation, here’s my list for today. I’ve signed up and will be posting my progress here (and in FB and twitter.) There are apparently prizes but I haven’t figured that part out yet. Let me know in the comments if you’re planning to participate.